This is a rare big NFL trade, one that will have major impacts for both teams. Blockbuster trades are rare in the NFL. Teams are naturally conservative with their assets, partially because it’s hard for players to learn new systems elsewhere and partially because NFL management is inherently conservative. That’s why the Raiders’ trade of holding-out linebacker Khalil Mack is so massive. 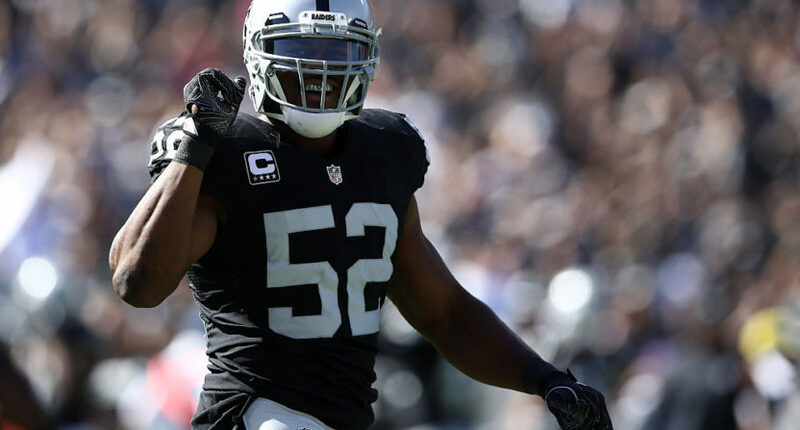 Mack, arguably the second-best pass-rusher in the league behind Von Miller, will head to Chicago in exchange for two 1st-round picks and perhaps other assets as well, according to Ian Rapoport’s latest reporting. In football, you don’t see players at the level of Mack available, particularly in their prime — Mack is still just 27. Oakland Raider fans, already distraught at their much-beloved team shipping off to Vegas in 2019, are the big losers of this deal. Mack is a bona fide superstar and by all accounts a good guy. Seeing an important long-term piece on a team that could have had a shot to make a run at the postseason is dispiriting, to say the least. It was only two years ago that Oakland went 12-4, remember. Derek Carr was an MVP candidate and Mack had 11.0 sacks and the most QB pressures in the league. They were a trendy Super Bowl pick last year until they went a quiet and disappointing 6-10. Jon Gruden was paid a ridiculous amount of money to get that team back. Now one of its core pieces is gone. Mack was in the midst of a hold-out as he searches a contract worthy of his top-tier status. The Bears are expected to give him that contract, which could exceed the value of Aaron Donald’s extension in LA. That the Raiders elected not to shell out the money is a rare cop-out on a major player. This is something you’d more likely see from a small-market baseball team. Gruden may be old-fashioned, but I find it hard to believe he’s old-fashioned enough to outrightly get rid of a superstar pass-rusher with no off-field issues, no matter how much money that superstar wanted. This, then, is either a long-term move from the Raiders front-office, trading a locked up salary cap for significant future assets, or it’s simply Mark Davis’s unwillingness to pay. The former would be optimistic from a football perspective, but also naive. I’m a Pittsburgh Pirates fan; unfortunately, I know how these things work. You’d like to be optimistic that this was a football move, but it feels more likely that Davis and the Raiders higher-ups want to keep the numbers down more than anything else. Chicago pounced, as they should have. They have a good young team and they just added a foundational piece. Mack should only get better at Soldier Field playing next to Akiem Hicks and 2016 No. 9 overall pick Leonard Floyd, with rookie 1st-round middle linebacker Roquan Smith anchoring a top-five pass rush alongside veteran Danny Trevathan. If you have a quarterback and an elite pass-rusher, you’re usually going to be good in today’s NFL. The jury is still out on Mitch Trubisky, who should improve in a 21st-century offense with Matt Nagy and Mark Helfrich. It’s also possible that he flails in an offense in which he’s given more playmaking responsibility. Trubisky has nice weapons to play with. Jordan Howard is a legitimate No. 1 back. Tarik Cohen is a talented gadget player who should get his share of carries, particularly in Helfrich’s fast-paced, creative offense. Allen Robinson II, signed from the Jaguars in the offseason, will be the top receiver, while Kevin White will aim to stay healthy for once. The concern for this Bears team, beyond Trubisky development and uncertainty in the secondary, was whether they had the top-end talent to compete in a difficult NFC North. With Mack, they have that top-end talent in spades. Nevertheless, it’s a big gamble for general manager Ryan Pace. Chicago went 5-11 last year and can only hope that Trubisky is the franchise quarterback. Giving up two first round picks is massive, and that’s not even knowing what else they’re sending. If Mack isn’t everything they expect him to be, this could fly back in their face. In a similar vein, Oakland could still win this trade. The assets they appear to be getting could be franchise-changing if used correctly. Maybe they will spend the salary cap space that could have gone to Mack on other talents to fill out the roster. Maybe the picks they receive become so important that trades like this will be more common in the future. But Mack is a generational player at one of the most valuable positions on the field. Oakland had a shot at a Carr-Mack offense-defense tandem for years to come, and they balked. Those don’t come around often, particularly if you’re not getting consistently high draft picks. The Bears chose to be aggressive, and it very well might pay off.